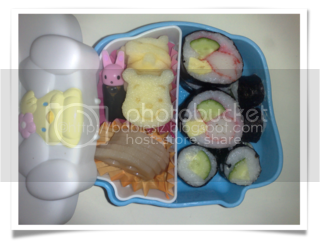 Left container: Rice with denbu and bunny shaped rice. Nuggets, carrots, lotus and cucumber. Banana by the side. 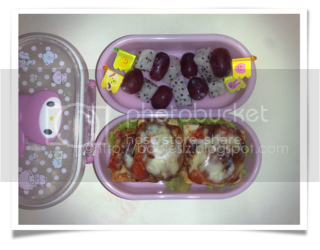 Since I am feeling better this morning, decided to prepare bento for my princess. 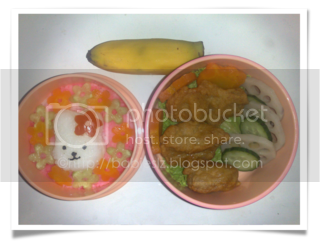 Realised I don't have much left in the fridge and so cook the nuggets for her and 'compensate' by decorating the rice. Some of you asked how I prepare the lotus, I simply steamed it when I cook the rice. I remembered I tried out Elaine's recipe using lotus roots and it taste great too. My kids love lotus root so I boil soup with it too and I have another recipe that I yet to try out. Will share once I have try it. Yeah! I have been feeling Beanie's kicks and moves! The feeling is great and fantastic! He makes me forget that I am sick at this time! I have been thinking if I should call my friend to tell her that we wouldn't be able to attend Alex's Birthday party.... Have been sick since Friday.... But it is tough for the few of us to meet up especially now that some of our kids are in primary school and the younger ones are in different school. In the end, I decided to go ahead as I do not want to disappoint them. LZdaddy and I discussed, we decided that L should stay at home to prepare for her exams (LZdaddy is in charge of teaching L maths) and I will bring Z to the party. L was disappointed of coz... Sorry Sweetie... Your exams is round the corner. And when she found out that her long time friend, Oliver was there, she was even more disappointed. Instead of saying hello to me first, Ollie asked where is L. These 2 has been friends since they were 1 yr old and they have not seen each other since LZ's birthday party last year. They moved to Holland and now back in Singapore for good. 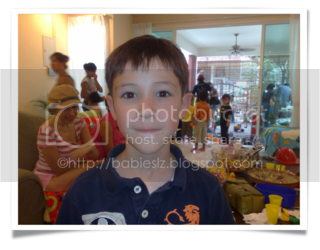 Z and Ollie's younger brother, Joshie, knew each other when they were in still in mommies' tummy. and they were happy to see each other. This pic is for L. The 4 of them have been very close till we changed their school. Countless of playdates & outings. Pics: L with Chyene, our group pic, proud parents with Chyene & LZ with godparents and godsister. It was such a joyous occasion for them. I can see how proud and happy my friends were. We are truly very happy for them and so were LZ. Since I can't carry her, I 'appointed' my princess to carry her godsister. 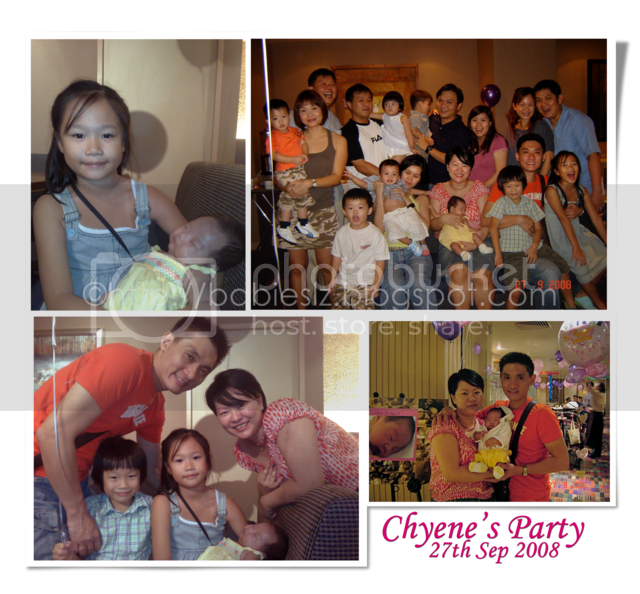 After much nagging & reminder from me (to be still and not move too much), L finally get to carry Chyene. Chyene is a very pretty baby (just like her mommy) and a sleeping beauty too. Hahaha... She was oblivious to her surrounding. Awwww.... I wish that my Beanie will be like that too in a few months time. See the group pic? It used to be only 5 couples and now, look at our group! Getting bigger and I believe there will be more to come. Especially next year, Beanie will be joining in the fun. But I think we need more girls in the children group leh... Can you see that LZ are the big jiejie & big gor gor among the kids? My kids are the oldest among them. It was tough trying to get a group pic of the kids. In the end, I gave up. We will probably be able to get one when they are older. 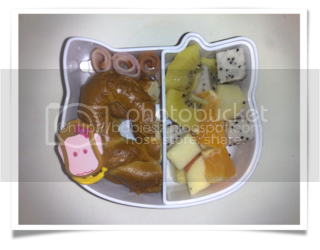 Both Bento consist of same thing: Assorted maki, Pooh shaped apples and lotus roots. 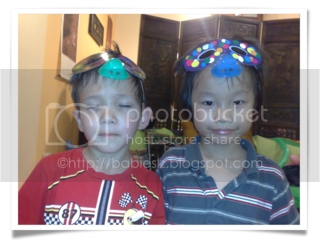 Both of them celebrated Children's Day today in school. I was feeling sick this morning but I didn't want to disappoint them since both wanted to have bento today, especially Z. He was soooo looking forward to his bento. L had her celebration 2 hours before school ends. A concert put up by teachers and PSG mummies. L told me she enjoyed the performance. Initially, I was asked if I can play the piano for the concert but I am not a professional leh... The last time I did that was for my cousin's wedding march in when I was pregnant with Z. I was so worried I may give birth early back then. Haha... Anyway, the PSG came up with a skit for the children. I think L's Chinese teacher very sayang her. She and another girl were the only ones getting little gifts from the teacher, a sharpener and a wrist pouch. She told me teacher quietly asked both of them to go to the office to get it from her after school. No wonder she came out so late today. She told me Valerie and her always help teacher so that's why she gave them pressies. I reminded her not to mention it to the rest, otherwise they may feel unfair or upset. Z: mommy, you need to pack snack for me. That means, you must prepare BENTO for me. Z: I tell you what mommy. I want to have sushi. The one with cucumber, the pink thing that is sweet sweet one (denbu), crab sticks and the one with everything mix. 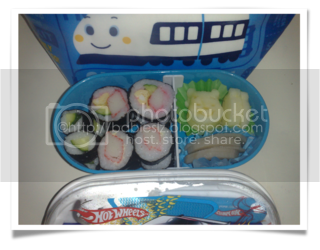 Me: Would you like mayonnaise with the crabstick maki too? See how excited he was? I was so blur! This morning, I reminded LZdaddy to send Z to the church side and not to the school AND I was so sure I was right that I didn't check the notice again. LZdaddy called from the church and said NOBODY was there! I panicked! I immediately called Teni to confirm. She told me we were supposed to send them to school and school has made transport arrangement for them to go to another church! See how blur I am! Moments later, LZdaddy called and said next time not to let Z carried such a 'girl girl' bag and he said the boys were carrying haversacks. See the pic? It is a hand carry bag with shinkansen on it. Aiyoh! Is it very girly? If I have known earlier, I would have used a haversack, easier for him. I thought they will be in school so let him carry that. Besides, this is a warmer/cooler bag. Anyway, Z never complains. When I picked him up, he happily told me he finished everything! He even opened his snack box to show me. Teacher told me Z was very excited with his snack box and showed teacher what he brought when she asked. Went of my amniocentesis test this morning with LZdaddy and Z. I was nervous the whole night that I didn't sleep well. We didn't have to wait long for my turn to see the Doc. I was glad to have such a wonderful Doc and nurse who assured me throughout. The Doc did a thorough check before she inject local anesthetic and drew out the fluid. Thereafter, LZdaddy and Z came in again to see how Beanie doing. Beanie was so adorable! We saw that both his hands were together as if he was praying. Then we saw him yawning again and put his hand on his face. How cute! Doc measured Beanie's head circumference, check on his size and warned me that I may have another BIG baby! Uh-oh! She looked through the file (LZ's birth records) and said that I shouldn't have problem giving birth to another big baby. L was disappointed that she couldn't join us as she has to attend school but I tried my best to describe to her what happen during the visit and what was Beanie doing. Again, I promised her the next visit, she will be there with us. Our next visit will be on LZdaddy's birthday, so special! Left: Rolled up ham on sticks, pretzel & jam in container. Right: Fruit salad. My princess definitely knows how to enjoy life and fully 'make use' of mommy before I am unable to prepare bento for her. Hahaha... She placed order for pretzel, a snack that both siblings love and mixed fruits. I am not capable to make pretzel so I bought the frozen ones for them. So now, they have another choice for their breakfast too. I remembered someone asked what to do I with the leftover (after cutting out the shapes I want). Well, I eat it while I cut. Haha! I have my 'breakfast' while cutting the food. Sometimes, I save it for later so I can munch on it or poor daddy will have to finish it for them. Of coz she has helping words to guide her how to write it and 4 pics to guide them. I think without helping words, it will not be that easy and she may not write that well. Good Job Sweetie! Mommy is very happy that you have improved so much in your composition writing. During recess, Sarah and Jane were chasing each other near the basketball court when suddenly, Jane found a purple wallet in a wet drain. They were excited and rushed towards the wallet. They picked it up and looked inside. They saw many coins inside the wallet. At first, Jane wondered what to do with it. Then she said,"We should not take it because it doesn't belong to us." Sarah agreed and decided to return it to the principal's office. The principal was pleased with them "I'm proud of you two. You did an honest act by returning the wallet," said the principal. The next day during Assembly, the principal related the incident to the whole school and praised Sarah and Jane for their honesty. Amy was keen to start working on her revision papers after she had finished her lunch. She was about to do her work when she heard two boys creating a din along the corridor. It was too moisy and Amy could not concentrate. She opened the window and was aghast to see the boys playing a game of soccer! She instruction them to stop playing at once. "Listen to me, you can't play here because you might disturb the neighbours. Besides, it is too risky and you might accidentally break the neighbours' window," said Amy. The boys looked at her sheepishly and gave an apologetic smile. To cheer them up, Amy suggested,"You can play in the open field over there. It's just a stone's throw away." After waving them off, she happily sat down to do her work, this time without any distraction. 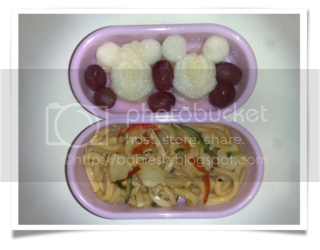 Top: Grapes, Mickey & Minnie shaped pears. Bottom: Stir fried udon with capsicum, cucumber, fish shaped Japanese fishcakes and shredded chicken. My girl wants to have udon for today's bento. I like to add cucumber to fried udon as it makes the udon crunchy when you eat it. I'm glad LZ have the same taste as me. Top: Diced dragonfruits and grapes on sticks`. Bottom: Pizzas with salami, sliced fresh button mushroom and diced capsicum. Something that my girl requested. Instead of the usual sausage or ham for her pizza, I suggested salami and she loves it. She said it taste better than the others. I think from now on, if we order pizza, my girl will look out for salami toppings. Just a note that Z said he loves his salami pizza too. After our hotel checkout, we went for our important appointment which was Beanie's 17+ weeks checkup. I think LZ were more excited than us! They kept reminding us of the appointment, especially Z. As like other visits, I have to measure my weight and blood pressure. My blood pressure was fine. Just a few weeks of being cautious with my weight gain before the last checkup, I began to lax and I paid a price for that. I gained 2.5kg! GOSH! That's not good and I really have to watch it. Blame it on LZdaddy! Haha! For buying lots of yummy stuffs for me to eat! I told Doc about my pelvic pain and she told me since I have this problem with my previous pregnancies, this time the pain will come earlier. I am also having numbness with my fingers at times and my morning sickness is not completely over. I still get morning sickness once a while. Something that we always look forward to is the scan. As usual, Beanie was sleeping (I think) and he wasn't moving much. This always caused me to worry and I think my Doc sensed it. She lightly 'jerk' my tummy so I can see Beanie moving. I think I am too paranoid..... We saw Beanie's heart beating so well, B's little stomach, B's hands and legs moving everywhere after woken up by my Doc. It was so nice to see Beanie opening his mouth and it looked like Beanie was yawning. Then while Doc was talking, we saw something in between Beanie's legs! There is DEFINITELY something there! At this moment, I looked at LZdaddy and he was looking intently at the screen. I was sure he was thinking the same thing as I do. I immediately asked Doc to confirm.... Beanie is a BOY! When Doc confirmed it, L first reaction was "OH MAN! A boy?! Huh...... I want a meimei!" Z first reaction was "YEAH! Baby is a BOYYYYYY!" I couldn't stopped laughing! Both LZ has such different reactions! Doc was sweet to try to console L but she was very disappointed. When we came out of the room, I talked to L and I told her not to be too sad and she will be my only princess and the special one. I'm sure she will get over it soon coz she loves to play with babies and once she sees Beanie, she will forget what she wished for. Z was sweet to console jiejie too "It's ok, jiejie. You are the special one and you are the only princess now. After didi comes out. We ask mommy to have a meimei for you." WHAT?! LZdaddy and Z obviously are the happiest ones. LZdaddy thinks that we have less worry for boys than girls. We have given up on getting Z to learn taekwondo (after he fractured his arms twice), for fear that he will injured himself again and I'm sure LZdaddy hopes that our Beanie will be able to take up martial arts. Z is happy that he will have someone to share his toys with and to talk about boy's stuffs. My dear blogging friends, did you guess right? L was smart enough to notice it when she saw the bag we brought along when we left the house. They finally found out the place we planned to go, Fairmont Singapore. LZdaddy had a free night stay at the hotel and it expired by end of this month. We wanted to book for the next weekend but it was the F1 race season and we can't use it for then. I think it doesn't make a difference to them since they just wanted to stay in the hotel. Our room view was not too bad. We got to see the "durian", Merlion & the pool. We lazed around when we check in till we have no time to go to the pool. We had to send the kids for their classes as I don't want them to miss their ballet and piano lesson. When we came back, we went for the buffet at Market Cafe in the hotel. 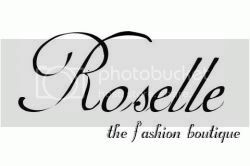 There was occasions when we tried booking for a table but to no avail coz they said we should book a day in advance. This time, we being the hotel guests, we managed to book a table few hours in advance. Well, we had free dinner at the cafe! Again, LZdaddy had free voucher for that and we were supposed to pay for L (above 6 yr old) but the cashier was so sweet not to charge us. If you like Peranakan food, you will enjoy the buffet. The next morning after breakfast, I went to the pool with L. Z didn't go coz just when we were about to leave for the pool, Z had a quite a bad cut on his leg. LZdaddy stayed in the room with him. He was actually quite upset that we went ahead without him. But I promised L to bring her to the pool and I have to keep my promise. My little boy was easy to pacify , a few kisses & hugs and he was alright. Before checkout, we decided to go down for lunch instead of room service. My 2 babies kept asking if we can stay another night and I think LZdaddy was about to give in but I said no. L's exams are coming and I really want to spend time to go through her work with her.